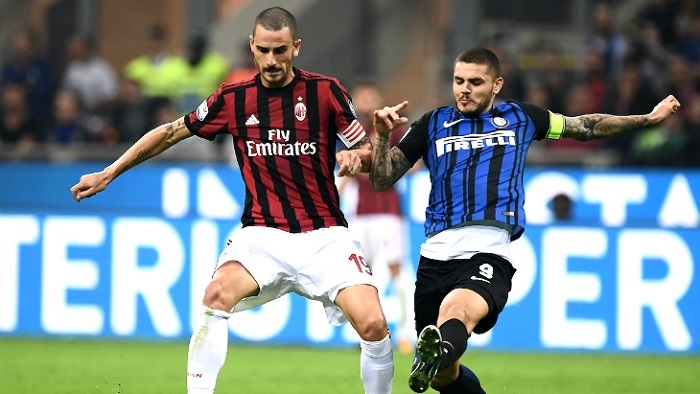 Inter vs Milan predictions ahead of Sunday night’s Serie A clash. Our experts have already made up a fully researched review and prediction. Inter spent previous season relatively well and managed to reach the 4th spot in the Italian championship standings. Herewith, their game was equally good. This season also gracefully started for Luciano Spalletti’s men. The team is currently on the 3rd place with 16 points based on 8 matches played. In many ways, they managed to achieve this result by virtue of reliable acting in defense. Inter scored 12 goals in 8 Seria A meetings, and in doing so conceded 6 only. Before the upcoming match Spaletti’s squad is considered as a favorite by bookmakers and experts. A good shape of the team is one of the factors for such preference. Unlike the rival, Milan cannot improve their performance and standings’ results vividly illustrate that. Although the team finished last season on the 6th spot of the Italian championship, they were 8 points behind the 5th-ranked Lazio. In the current season, Milan may boast only 10th place with 12 points gained. Needless to say, such a result hardly suits both fans and “bosses” of the team. It is noteworthy that Milan display attacking football and score a lot (15 goals in 8 matches), but often forget about the defense. Ten goals conceded in eight games is another proof of that. It’s clear that Gattuso’s squad would be highly motivated to beat the opponent. But Inter would be surely extremely stimulated to this meeting as well. As has been mentioned, Milan demonstrate attacking football and score a lot but often miss out. Inter usually focuse on defense, but in such a principled match the team is likely to actively use attacking skills as well. Last 4 from 5 head-to-head meetings ended with 3 or more goals scored. We are waiting for a spectacular derby with numerous goals scored. Therefore, our bet has all chances to succeed.